It has been cool and raining the past few days. Good conditions for downy mildew. Despite the cooler climate we live in here, and the regular rains we have, this fungal disease is surprisingly uncommon in our vineyards in its classic form. We have a persistent breeze that blows in over most of our vineyards, effectively keeping the vines dry even after a rain and its seems, for the most part, not providing ideal conditions for downy mildew to become a persist problem. In fact, until last year, which had a particularly wet spring, I had actually never seen the classic downy mildew infection. For the past 15 years I had read about looking for the classic “oily” spots on top of a leaf, searching for it, but never seeing such in our vineyard until last spring. Downy Mildew: classic “oily” spot on the upper surface of a leaf. Downy Mildew: classic white fungus growth spot on the under surface of a leaf in the same location as the oily spot. Do note, that downy mildew should not be confused with a mite infection, which also creates a white spot on the underside of a leaf, but can be differentiated from a fungus by the raised bump mites create on the upper side of the leaf. 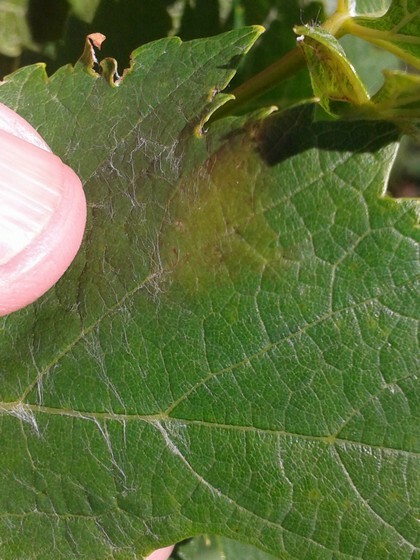 Grape leave mites: upper side of leaf showing a pronounced bump. 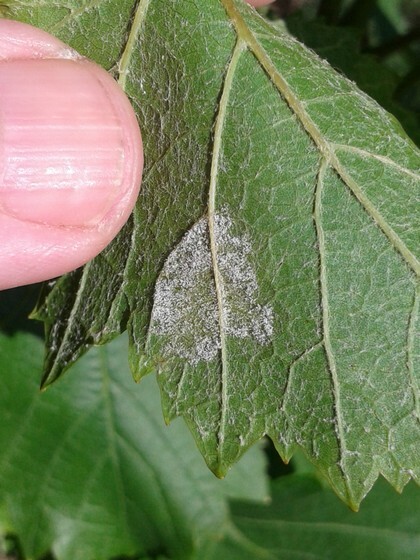 Grape leave mites: lower side of leaf showing white mite colony. Grape leaf mites only directly attack leaves, not grapes. But if they are too persistent and numerous, they can cause an affect on the grapes by damaging enough leaves to decrease the ability of the vine to ripen the grapes. We use a combination of our routine sulfur spray schedule and integrated pest management to control mites. 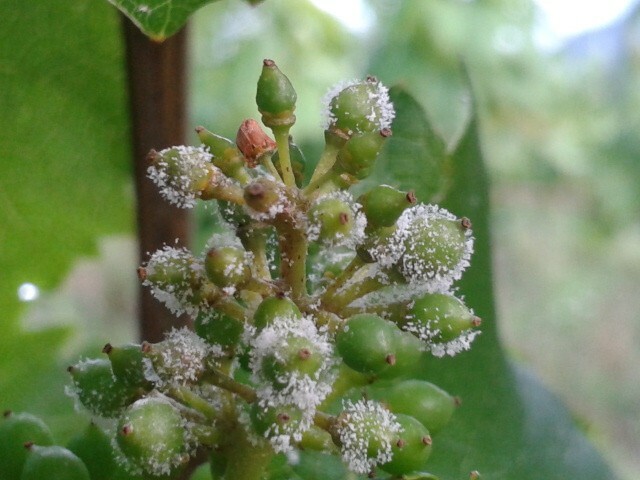 Thus we always have some minor mite infection, but that is okay since they are part of balanced pest management and so act as a food source for the predatory mites which keep the grape leaf mites in check.